One thing I've been talking a bit about lately is my apprehension over baking. This might sound silly to many of you aficionados out there, but given that only one of my many apartments over the past several years abroad had an oven in it (and that was only for a couple of months), baking still makes me feel like I'm in over my head. I've been dabbling with easy desserts here and there since coming home, but nothing terribly impressive or technical. I've been stove-top cooking by the seat of my pants for so long now, that baking - with its very precise instructions and ingredients - tends to make me nervous! You can't taste it and add more salt half way through, if need be, or thin it out if it gets too thick. As a result, I have an ever-growing stack of untested recipes at home, but slowly, I'm getting the courage to tackle some of them. On Sunday night, I experimented with this Lemon Cheesecake with Fresh Berries recipe from a website called My Baking Addiction. Jamie, the baker and operator of the site, calls this recipe 'the best'. You may be thinking that cheesecake is not a very adventurous step forward for me, but if you take a look at Jamie's website, you'll see that she's a pretty amazing baker, so it is with great trepidation that I try her 'best' recipe for anything. There were several moments when I thought this cheesecake just wasn't meant to be: Realizing at 11pm that I had 3 eggs and not the 4 the recipe called for, remembering how long cheesecakes need to cool in the oven after baking, and then how much attention they still need after baking and cooling. This led to scrambling for an egg replacement (1 tablespoon of cornstarch + 3 tablespoons of water) and hoping and praying it wouldn't ruin it, a phone call to my mother, setting my alarm several times throughout the night to check in on the cooling process, and then bringing the cheesecake into the bedroom to cool so as to avoid unneeded attention from the cat (who has a penchant for hunting down late-night snacks). I have never been so devoted and attentive to a baked good in my life. Needless to say, it turned out to be a late night for me that night, but the pains seemed to have been worth my while: what a beauty she was! Smooth, fragrant, and firm. 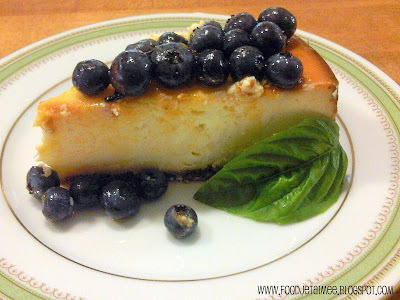 I served the cheesecake last night when F. and I went to a BBQ with some of my oldest friends, and I was inwardly begging the culinary gods that it'd be as nice inside as it was on the outside. This being my first cheesecake in probably 8 or 9 years, I was pretty pleased with the result. I had forgotten my camera at home, once again, so I had to take these on my phone. Here is Jamie's recipe, taken directly from her post called The Best Cheesecake. If you follow this link, you'll also see lots of great tips for baking cheesecakes in general, not to mention gain access to the rest of the website and her fabulous collection of recipes. 1. For glossy berries, simply add 1 tablespoon of hot water to ¼ cup apricot preserves. Blend until combined and thinned out. Place the berries in a bowl and gently brush and toss the berries with the apricot and water mixture. 2. If you are not a fan of lemon, simply omit the zest. What I loved most about this recipe was its wonderful lemon flavour. It was light and tangy on the tongue and gave it a nice summery twist. Next time, I might even add a little more lemon zest, along with finding a way to secure the berries to the top, so they don't scatter while cutting into the cake. I also added the fresh basil from Angie's herb garden to set off the colours in the cake and give it some additional flavour. The only other thing I did differently from Jamie's recipe was that I didn't submerge this cake in a full bath to avoid cracks: I simply added a shallow pan of water to the bottom rack of the oven. A genuine shortcut or did I just get lucky? Either way, I definitely feel like I'm getting back into the swing of things. Me and my oven; my oven and me. Looks amazing dear! Love all those plump berries on top! Seriously, I've been craving cheesecake for a week or so now....temptation is everywhere! as one of the 'oldest friends' that was lucky enough to partake in the tasting of this yummy adventure, i have to say i was super impressed. full points for presentation and the cake itself was light, moist and delicious. 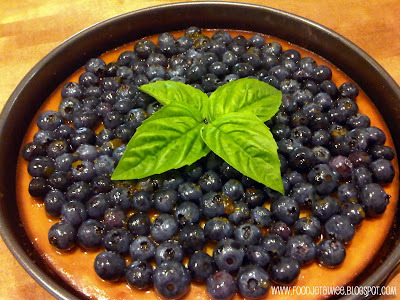 the simple berry topping was perfect - not too sweet, as cheesecake toppings sometimes can be. aimee, you definitely inherited debbie's natural skills in confectionery endeavors! Congratulations! It is (was) a thing of beauty! Thanks for the jam recipe, we're still pickin' up here, so I hope it will get put to use this year. You're not by chance going to see Arcade Fire on Thursday are you? Looks great Aimee...love the presentation as well. 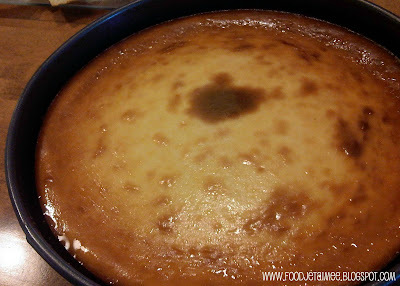 Great job as cheesecakes can be a bit of a pain at the best of times especially trying to avoid cracks. I've watched you make some pretty complicated recipes over the years that only a seasoned baker could accomplish so you should be proud of yourself. I have the same discomfort and fear of cooking. Love baking and even trying something new I am at ease. But I am always terrified when it comes to savory... And one thing I notice - all my friends always try something new at night! LOL! 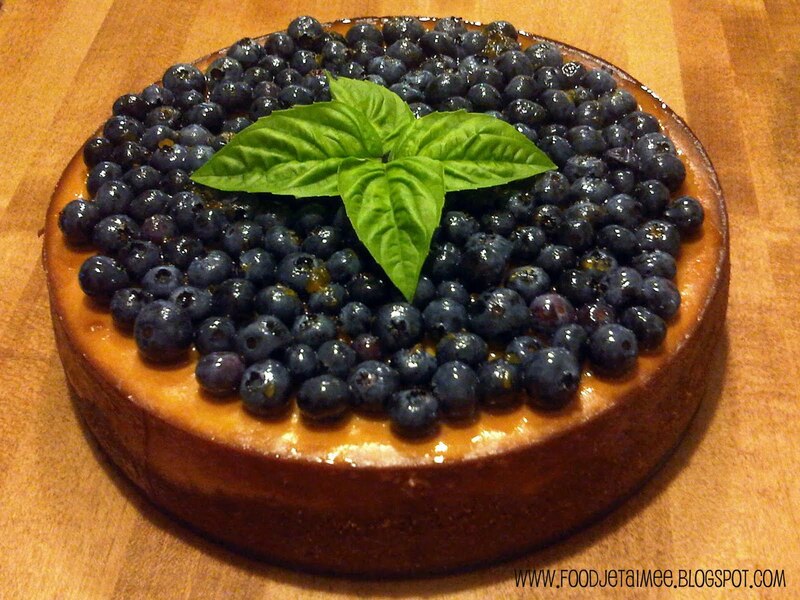 Your cheesecake looks perfect! Congratulations! Why ever try anything that isn't simple? Simple is yummy! Cheesecake looks stunning Aimee. A perfect blend of sweet with a hint of tartness from the berries and lemon.